Volume I: Strawberry Lane (The Elfin Knight) - Thomas Moran. The False Knight Upon the Road - Duncan McPhee & Frank Quinn. The Outlandish Knight (Lady Isabel and the Elf Knight) - Fred Jordan. The Douglas Tragedy (Earl Brand) - Henry McGregor. The Twa Sisters - John Strachan, Dorothy Fourbister & Ethel Findlater. Lord Randal - Jeannie Robertson, Elizabeth Cronin Thomas Moran, Colm McDonagh & Eirlys and Eddis Thomas. Edward - Mary Ellen Connors, Jeannie Robertson, Thomas Moran & Angela Brazil. King Orfeo - John Stickle. The Cruel Mother - Duncan Burke Cecelia Costello & Thomas Moran. Broomfield Hill (The Broomfield Wager) - Cyril Poacher. Captain Woodburn (Captain Wedderburn's Courtship) - Thomas Moran. The Two Brothers - Lucy Stewart & Nellie McGregor. The King's Daughter - Willie Mathieson. Lord Bateman - Thomas Moran & Jeannie Robertson. Lord Thomas and Fair Ellen (Lord Thomas and Fair Annet) - Jessie Murray. Lord Lovel - Ethel Findlater. Lord Gregory (The Lass of Roch Royal) - Elizabeth Cronin. Little Matty Groves (Little Musgrave and Lady Barnard) - Jeannie Robertson. Barbara Allen - Jessie Murray, Fred Jordan, Charlie Wills, May Bennell, Thomas Moran & Phil Tanner. George Collins - Enos White. False Lamkin - George Fosbury. The Pricketty Bush (The Maid Freed From the Gallows) - Sarah Ann Tuck and Julia Scaddon. The Bailif's Daughter of Islington - Albert Beale. The Famous Flower of Servantmen - Carolyne Hughes. Volume 2: The Royal Forrester (The Knight and the Shepherd's Daughter) - John Strachan. Clear Away the Morning Dew (The Baffled Knight) - Emily Bishop. Robin Hood and Little John John Strachan. Sir Hugh (The Jew's Daughter) - Cecelia Costello. The Battle of Harlaw - Jeannie Robertson & Lucy Stewart. Mary Hamilton (The Four Marys) - Jeannie Robertson. The Bonny Hoose o'Airlie Belle Stewart. The Gypsy Laddie - Harry Cox, Jeannie Robertson & Paddy Doran. Georgie (Geordie) - Harry Cox. The Dowie Dens o'Yarrow - Davie Stewart. Clyde's Water (The Mother's Malison) John Strachan. The Green Wedding (Catherine Jaffray) - Cecelia Costello & Thomas Moran. Eppie Morrie - Jimmy MacBeath. The Laird o'Drum - Lucy Stewart. Glenlogie (Jean o'Bethelnie) - John Strachan. The Bonnie Rantin' Laddie - Willie Mathieson. The Grey Ghost Cecelia Costello. Lang Johnny More - John Strachan. Willie's Fatal Visit (Willie's Fate) - Jeannie Robertson. The Cuckold's Song (Our Goodman) - Harry Cox, Mary O'Connors & Colm Keane. The Farmer's Curst Wife - Thomas Moran. The Jolly Beggar - Jeannie Robertson. The Beggarman (The Gaberlunzie Man) - John Strachan, Maggie and Sarah Chambers & Togo Crawford. The Keach in the Creel - Michael Gallagher. The Golden Victory (The Golden Vanity) - Dodie Chambers. The Mermaid - William Howell. The Trooper and the Maid - Jimmy MacBeath. Duncan McPhee, age 19, proved to be somewhat shy about singing his Scottish stanzas. Even though he was among his peers, the other teenage Travelers (sic) at the Perthshire raspberry-picking camp, Hamish Henderson and Peter Kennedy, amid shouts of "Come on, Duncan!" had to appeal to the company as a whole to use their group coercion. This eventually involved picking him up bodily and threatening to roast Duncan over the flames of the campfire. (It sometimes happens that collectors, in order to rescue important ballads and preserve our musical heritage, have to resort to somewhat drastic methods) - My italics. Now call me old-fashioned, if you like. But, 'Sing me a song or else I'll kill you'? Can you imagine Cecil Sharp, Gavin Greig, or anyone else for that matter, acting in such a manner? It just beggars belief. But then, these are another couple of albums from Peter Kennedy's series Folk Songs of England, Ireland, Scotland and Wales that were originally issued - in slightly altered form - by Caedmon Records of America. Sadly, all previous criticisms that have been made about this series still apply! I don't exactly know how many of Professor Child's 305 ballads were extant in the latter half of the last century, probably less than a third, but versions of fifty-one ballads are included on these two CDs. Versions of a dozen of these can also be heard on the CD The Muckle Sangs (Greentrax Records CDTRAX 9005), whilst another fourteen versions can be heard on the cassette Early Ballads Sung in Ireland 1968 -1985 (European Ethnic Oral Traditions - no issue number - Trinity College, Dublin). 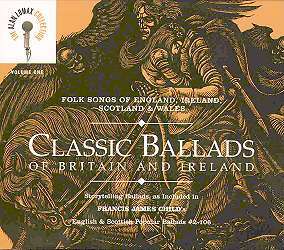 These two issues also include a handful of Child ballads that are not available on the Rounder CDs, such as Tam Lin, The Bonny Banks of Fordie, Young Johnston, The Housecarpenter and Lord Abore. Kennedy is right to say that many of the ballads have survived best in North America - as Cecil Sharp found when he visited the Appalachian Mountains earlier in the century - and here one thinks of, say, Maggie Hammons Parker's extremely fine version ofthe ballad Hind Horn which can be heard on another Rounder CD (Rounder 1504/05). Nor is it surprising to discover that several other rarities have survived along the outer edges of the British Isles and Ireland - take John Stickle's amazing King Orfeo for example. 'That a tune should in the midst of the twentieth century be recovered for this whisper from the Middle Ages was as little to be expected as that we should hear a horn from elfinland blowing', is how Bertrand Bronson expressed it. Ballad tune families are both very stable and very ancient. In many cases, they predate the texts, and undoubtedly serve as powerful mnemonic devices ... [Bronson] suggests a kinship between ballad tunes and certain Gregorian melodies, for example, D'Urfey's tune for Child No 1, Riddles Wisely Expounded, which resembles "almost note for note" the Sanctus in the Mass Orbis Factor of the eleventh century ... It is likely that these tunes themselves come from popular sources ... It is perhaps for this reason that listeners who do not yet know these songs will nonetheless find them somehow uncannily familiar. As expected, the singers heard on these two CDs give us some quite wonderful and amazing performances, and they cannot, indeed should not, be faulted. They range from the relatively well-known, such as Jeannie Robertson and Harry Cox, to the somewhat obscure. Of the latter, I was especially interested to hear Albert Beale of Kenardington in Kent whose father, James Beale, sang a number of songs to Cecil Sharp in September, 1908. If there is a problem here, then it must lie fairly and squarely at the compiler's feet. The CDs are subtitled, 'Storytelling ballads'. In its simplest form, a ballad is a story set to music, and the best way to hear the story is to let the singer get on with it - in its entirety. Kennedy disrupts these ballads in two ways. Firstly, by omitting verses, and, secondly, by stringing odd verses together from different singers, thus spoiling the flow of the story. Let's look at the first point. In the ballad Lang Johnny More, for example, we are allowed to hear only five verses sung by John Strachan. Kennedy then prints a further thirty-eight verses in the accompanying booklet - none of which appear on the CD. Seven of Cecilia Costello's verses are omitted from The Grey Ghost, two of Jeannie Robertson's from Willie's Fatal Visit, five from Davie Stewart's Dowie Dens o' Yarrow, and no less than fifteen of Willie Mathieson's verses from The Bonnie Rantin' Laddie. There are also verses missing from The Douglas Tragedy, Robin Hood and Little John, Georgie, Eppie Morrie and The Golden Victory. At least in these versions, we know that there are missing verses, because Kennedy prints them in the booklets. But he does not do so for those tracks that are compilations of different singers. Here, not only do we get these strange, unlistenable hybrids; but we are also unable to tell exactly what it is that Kennedy has omitted because he does not print the missing verses. Frankly, if you care about folksingers and their songs and ballads, then, like me, you will no doubt find the whole thing a shambles. On the track devoted to the ballad of Barbara Allen, for example, we find six singers, three from England and one each from Scotland, Ireland and Wales. Lord Randal also features six different singers, this time three are from Ireland (including a version from a Gaelic-speaking singer), one is from Scotland and, finally, two are from Wales. The latter, by the way, sound woefully out of place on this album. One can only assume that they were included because the singer Eirlys Thomas was, at the time, Mrs Peter Kennedy - although this fact is also omitted from the booklet notes. The first traditional singer to record for the School (of Scottish Studies) was Willie Mathieson, a septuagenarian retired farm servant who had devoted much spare time throughout his life to collecting songs. In his kist, which he transported from farm to farm when he got a new fee, were three large ledger books full to overflowing with songs of all kinds, from classic ballads through lyric love-songs to place-name rhymes and bairn songs. Willie had either collected songs on the spot from his fellow ploughmen, or had diligently followed up his informants by correspondence. He had also tried his hand at versifying, and one of the poems which he wrote down alongside ballads and bothy songs was a moving elegy for his dead wife. Willie Mathieson was quite capable of discoursing knowledgeably about different 'weys' of a ballad, and he would often quote "what Gavin thocht aboot it" - giving the great collector his first name, in familiar Scots style - but the ballads, especially the tragic love ballads, were closer to him (and 'truer') than they could possibly be to the mere scholar; when he referred to Barbara Allen's callous cruelty to her luckless lover on his death-bed, he would shed tears. What I am trying to bring out is that the Scottish ballad scene - the ambiance of the makers of the 'Muckle Sangs' - has a quite different atmosphere from the English scene. Who can imagine one of the folksingers from whom Cecil Sharp collected - or a later singer from the same area of Somerset - referring to him as 'Cecil'? The literary aspects of the ballads, as applied to Scottish singers, has been fully explored by David Buchan in his book The Ballad and the Folk (London, 1972). But there should, I feel, be a distinction made between, say John Strachan, and the many travellers who have retained so many ballads in their repertoire. We are told that Strachan was a subscriber to Gavin Greig's Last Leaves of Traditional Ballads when the book was published in 1925. He certainly referred to the book whilst singing and at times we can hear him gently turning the pages on some of his recordings. Travellers, of course, did not have access to such expensive books and so have relied far more upon an oral, as opposed to a literary, tradition. English singers, such as Harry Cox and Walter Pardon, have also relied more on an oral tradition, albeit one backed up by the broadside press. Walter had four Child ballads in his repertoire - The Broomfield Wager, Lord Lovel, Raggle-Taggle Gypsies and The Farmer's Curst Wife - and all were learnt by word of mouth; and I suspect that the same could be said for Harry Cox. I am also a little uneasy about Jeannie Robertson's singing of Little Matty Groves. According to her biographers, James Porter & Hershel Gower, Jeannie had two versions of this ballad, one 'long', the other 'short' - presumably it is the 'short' version that we hear on the Rounder CD. It is said that she only sang this ballad 'intermittently'. It is, of course, an extremely rare ballad to be found in the British Isles today - and Porter & Gower failed to provide a transcript in their book Jeannie Robertson: Emergent Singer, Transformative Voice (Knoxville, 1995). Some years ago I was told that Jeannie had, in fact, learnt this ballad from a visiting American folklorist. If this is the case, then, again, the notes are lacking. I'm sorry to say that this is not a unique example. There is a version of The Housecarpenter on the Early Ballads Sung in Ireland cassette that I mentioned earlier. Again, this is a ballad that is still common in America, but now almost absent from the British and Irish traditions. In the notes to the cassette we read that the ballad was 'Apparently not recorded elsewhere in Ireland, but common in America, where (the singer) was born and lived to an early age.' Now what does this mean? Did the singer learn the song originally in America, or not? His tune is certainly different from the ones most commonly associated with the ballad in America, but surely folklorists have a duty to be clear on such matters. We are told that the notes have been revised by Peter Kennedy. It would have been good had he pointed out important versions of the ballads that have been collected since he and the other collectors had made these recordings, rather than simply saying how many versions are to be found in Bertrand Bronson's Traditional Tunes of the Child Ballads (Princeton, 1962-72). We are not, for example, told of Sarah Cleveland's splendid, and highly important, version of The King's Daughter - titled Queen Jane - which was issued some years ago on a Folk-Legacy LP (FSA-33). Nor is mention made of Packie Manus Byrne's Songs of a Donegal Man (Topic 12TS257) which contains a number of other rarely heard Child Ballads. In fact, the only other recordings mentioned are those made by Kennedy or other collectors whose work appears in this series of CDs. In many ways I would like to be more positive about these two albums. Some of the tracks, especially those where the ballads have been presented in their entirety, are outstanding and of the utmost value. Many more tracks would have been valuable had they not been so savagely mutilated. And so, as I have said before, we return to this incomprehensible lack of sensitivity on the part of Peter Kennedy who is listed as 'editor' of these two CDs and of the entire series. It looks as though the rest of them will continue to appear in similar form, which will be a great shame. These CDs are being issued as part of 'The Alan Lomax Collection', although Lomax only recorded a small proportion of the tracks. Previous releases, such as the Southern Journey set of CDs, have been outstanding and it is a pity that his name is being associated with this hotchpotch of a series. 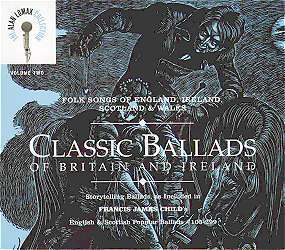 Folk Songs of England, Ireland, Scotland & Wales could have been the most important series of recordings of British and Irish folksong and balladry every issued. But, it is not. What a missed opportunity!